Me: Dude – who’s your friend? Riley: I like to call her Miss Anna Banana. Riley: Yep. Tastes good too. This entry was posted in grandchildren, Uncategorized. Bookmark the permalink. They definitely have a mutual admiration society going on – she walks around saying “Riiiiiiii-riiiiiii”. 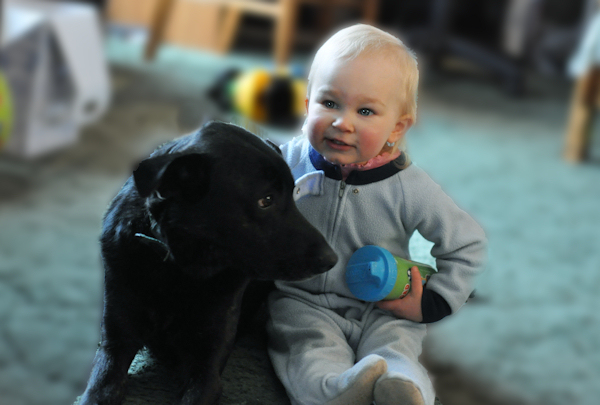 And Riley may be hell on the UPS man, but he loves his babies. Anna Banana is so cute. That is cute on a plate for me. Love it! love each other! great series of photos…. Awww, how sweet! So cute! I remember when her mother told me under no circumstances were any of my dogs to kiss her children, ever! I think that was before Mark allowed Daisy, Riley or dog du jour to clean his teeth. Love to see these two hangin’ together! A quickie but goodie! Sometimes, they’re the best. 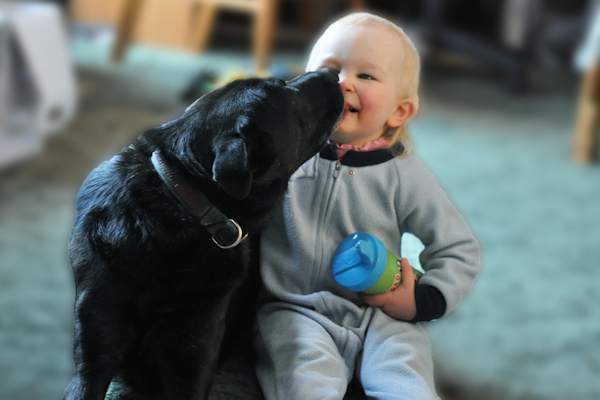 Not much cuter than babies and dogs! I love it! Way back when my little guy was about 7 monts old I heard “Lalalalalalalalalalala” coming from the other room. I thought, “Oh, how cute, my baby is singing!” I went around to see and what I found was the baby saying “Ahhhhhhhhhhhhhh” and the dog’s licking providing the “L”. NIIIIIIIIICE! I like Lori’s comment almost as much as the original post. Funny! Awww. They look like good friends.